In Summer the bee actually cares very little about what the varroa does, as it is mainly focused on the drone brood amongst the small cell bees. Advanced colonies are also regularly cleaning out the mites in the drone cells. 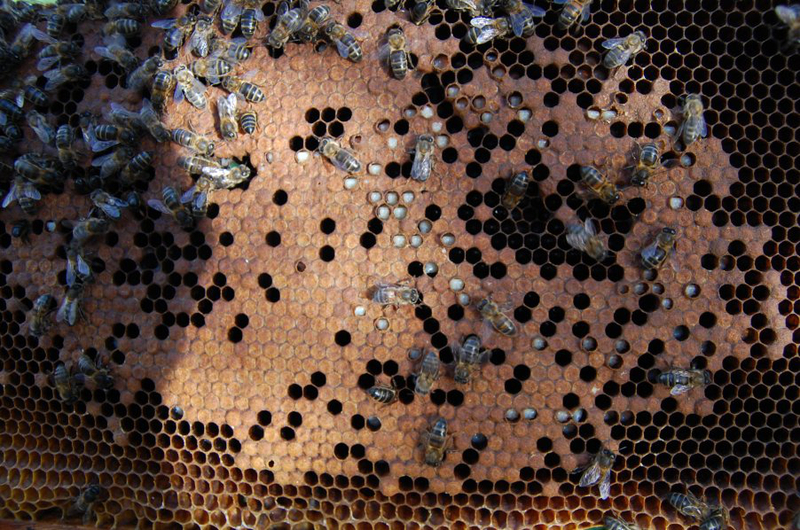 But as long as the drone brood is present, there is little desire interfere on the bees side.At the bottom line the Varroa is not the only risk but mainly the consequent diseases. Erik from Sweden said the bees there were able to survive more then 20.000 mites per hive without becoming victims of the DWV (deformed wing virus). Then they started to treat with acids, and the consequence was that the bees already showed deformations with 1000 to 2000 mites in the hive. We can see that all this has a lot to do with stress and the immune system is greatly affected by the use of chemicals. The interisting thing is that in spain the resistance to the DWV Virus is increasing (Dr. Fernando Calatayud, biologist, Valancia, spain). There beekeepers are not used to treat mites with organic acids, but in sweden almost exclusively. This means that most probably the use of acids reduce the resistance to the DWV virus. This seems logical when one considers that these eat holes in the exoskeleton of the bee. Back to the incubation period. Due to the fact that, within the small cell bees, the mites focus on the drone brood, the breeding time of the bee throughout this time period is only indirectly critical. As the mites are not in the worker brood , it cannot affect on the development of the varroa. But why are there no mites in the worker brood? Because it is aware of the fact that due to the shortened incubation period, it can’t multiply there and prefers the drone brood. (There are other reasons as the limited space in the cell, but this is not so relevant) The drone cells have twice the volume of food than the worker cells, which attracts the mites . Dee Lusby speaks of the pseudo-drone effect and coments that in large cell bees the mites confuse worker brood with drone brood. These cells of the conventional bee are almost as large as the drone of small cell bees and also of the bee Apis cerana, where Varroa indeed comes from. And here comes the crux. Dee comments that the cleaning behavior (we call it the baldheaded brood) depends primarily on the number of bees for the necessary work. There are priorities, or let's say a hierarchy. Feeding the brood is more important than cleaning it, for example. But because the lifetime of the small cell bee is considerably longer (8-12 weeks) than the one of the large cell bees, we have a lot more bees available for the same amount of work. And lets imagine all their duties for a moment , breeding, feeding, cleaning cells, quick paint everything with propolis, honey, ventilate, nectar, fetch water, pollen, guarding the entrance etc etc. This means that the small cell bees get started much earlier with removing the varroa from the infected cells. And this is entirely matching our experience. If we observe small and large cell hives by the same mothers, we see bald-headed brood in the former, and none in the latter. That comes only when it is already too late. Of course we can and must also breed for cleaning, but according our experience, the above-described is far more important and fundamental. So we can see that we have a much better starting position with small cells and it is then much easier to steer in the right direction with breeding. Michael Bush made some tests. He bought normal commercial queens of different races and converted part in small cells and the other part on large cells. All small cell hives showed hygienic behavior, of the large-celled bees none did. Why do small cell bees live longer? During the winter months a bee can live over 6 months. Because they do not get exhausted by a lot of work. 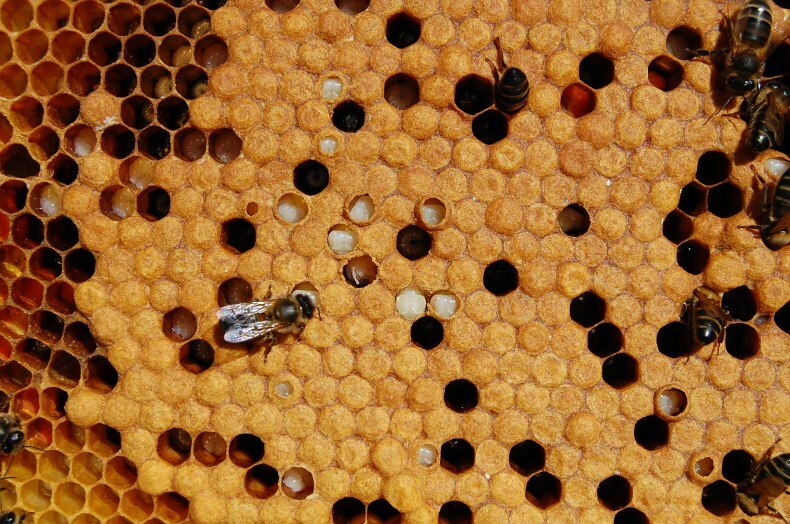 Within the small cell bees we have a much more compact brood nest due to the smaller cell size and also a smaller distance between the honeycombs. 3 frames of Langstroth small cell bees have as many cells as 4 frames of large cell bees. Thus, the volume of the brood nest is considerably smaller and there are fewer bees to do the same required work. We now know that today’s problems threatening bee colonies are caused by too much stress. Stess factors are the disease, chemicals in the hive, improperly placed honeycombs, to large cell sizes, bee species that are not adapted to the environment, contaminated wax, too much or too little drone brood, destroyed micro-fauna, beekeeping practices that do not dignify bees, just like queen excluders, swarm prevention, profit-oriented selective breeding, migration, feeding with artificial foods, artificial pollen, syrup etc etc. And whoever is exposed to too much stress gets sick and his immune system is weakened considerably. The bees in small cell hives do no longer have to work until absolute exhaustion, because there are far more bees for the same amount of work.They live longer. The larger the colony gets, the more relaxed is the situation. Cleaning behavior, VSH, hygienic behavior, bald headed brood is all the same. It is also possible to breed, but not stable. If this were so, we would have been much more successful after the decade-long resistance breeding. Another interesting observation that I made ​​with my hives, which began to defend themselves against the mites, was that the consistency and the amount of propolis changed. Much much more propolis and incredibly sticky. But only in this transitional period, and later it was back to normal in quantity and quality.